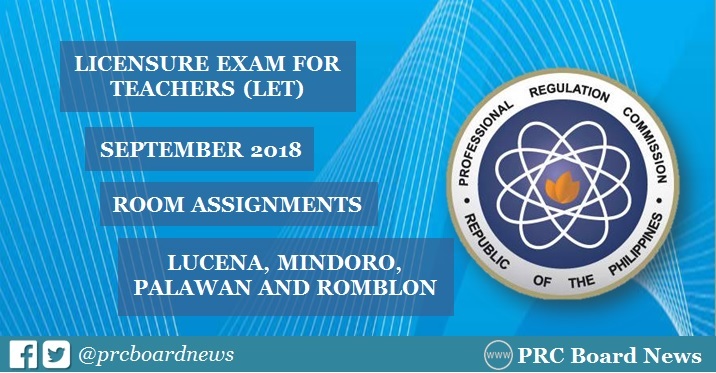 MANILA, Philippines – The Professional Regulation Commission (PRC) Lucena regional office announced the room assignment for the examinees of September 30, 2018 (Sunday) Licensure Exam for Teachers (LET) or teachers board exam. PRC Lucena handles Lucena, Oriental Mindoro, Occidental Mindoro, Palawan and Romblon testing centers for the September 2018 LET. In addition, PRC advised examinees of LET in Lucena City that the date of examinations coincided with the 42nd National Milo Marathon to be held in the city. In this regards, takers are advised to come a day before the examination to check their place of exam and room assignment to avoid being late. In addition, roads will be closed during the marathon. 2. Bring the following: Notice of Admission (NOA) or Application Stub, Official Receipt, pencils no. 1 or 2, black ball pens, long brown and long plastic envelopes and extra pictures. PRC Board News will also update this page for the results of September 2018 LET. Monitor this page for the updates on room assignment or visit the official website of PRC (prc.gov.ph) for more information.